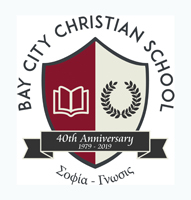 The mission statement of Bay City Christian School expresses our desire to work with parents to see their children grow in the following areas: academic excellence and spiritual maturity. Our school crest is designed to express these concepts. Not only are an open Bible and an academic wreath prominently displayed, the Greek words Σοϕία and Γνωσις are also engraved below the crest. These words, translated as wisdom and knowledge respectively, permanently emphasize our academic and spiritual mission. Although there are a variety of uses, Σοϕία (transliterated Sophia) can be described as the ability to discern based on an understanding of Biblical principles. Γνωσις (Gnosis) focuses on the acquisition of intelligence. You can see why these two words summarize beautifully the goal for students, teachers, and even for parents! Here is a homework assignment that should prove to be insightful for your family devotions: find all the places in Scripture that the words wisdom and knowledge are used together (Old and New Testament). You will find them describing people such as Daniel and Bezalel (who?) and declaring that full knowledge of these is found in Christ.